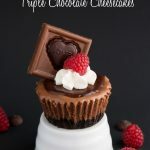 I first shared this recipe on Recipe Girl where I am a contributor. 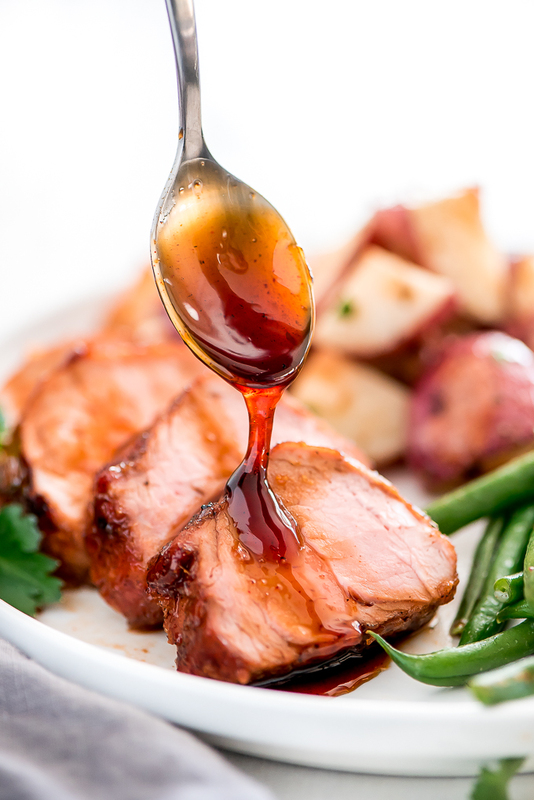 This Maple Glazed Roasted Pork Tenderloin is an ultra tender cut of pork that will leave your dinner guests ranting and raving over your skills in the kitchen. 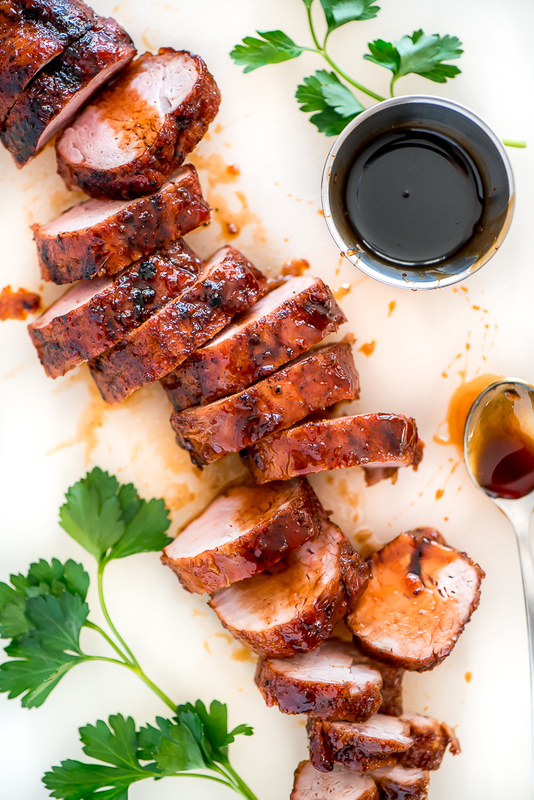 There nothing worse than dry tough pork and that is the opposite of what you get in this pork tenderloin recipe. 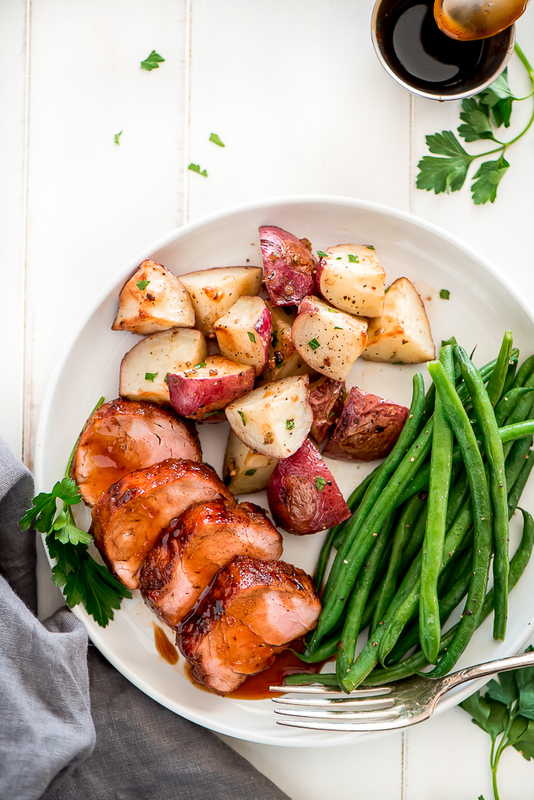 My Slow Cooker Pork Chops & Gravy is my favorite but this Maple Glazed Roasted Pork Tenderloin comes close. I mean, it’s coated in layers of sugar! Coat loin in a light layer of cornstarch, sugar, salt, and pepper. Sear it on all sides to seal the juices in and give it a beautiful browned crust. Baste loin with a glaze and then bake. Baste with sauce multiple times while baking. Once it reaches an internal temperature of at least 145 degrees F, it is done. I prefer mine cooked to around 155. Let the pork rest so that it doesn’t lose it’s juices when you cut into it. 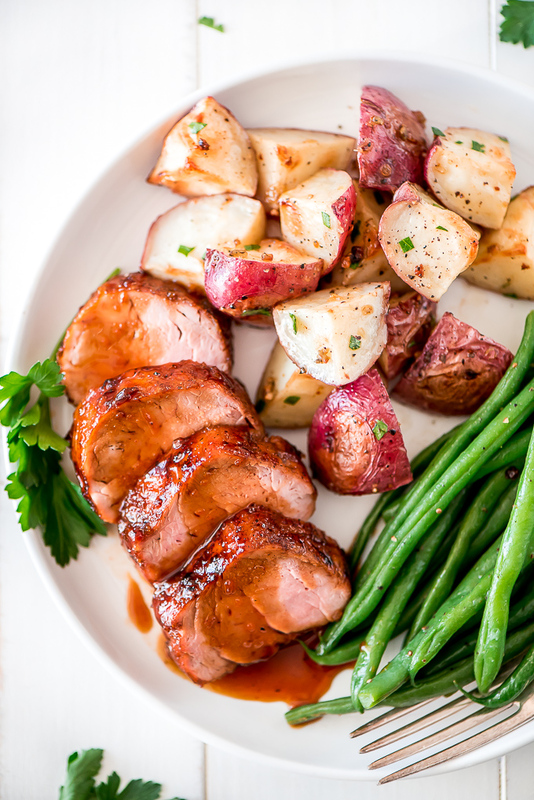 To balance the sweetness of the pork, serve with Garlic Roasted Red Potatoes and steamed green beans. The sweet and salty combo is perfect and the neutral beans are a nice balance to the strong flavors of the tenderloin and the potatoes. Serve this meal to your next dinner guests and they’ll be begging to come back again. 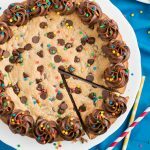 Baking & Cooling Rack– Oven & dishwasher safe. I use this to cook all kinds of meat and anything you want crispy. Also great for cooling cookies. Liquid Measuring Cup– Adequately measure your liquid ingredients! I like to measure everything in the same measuring cup to cut down on dishes. Preheat oven to 375 degrees F. Line a pan with foil and place a cooking rack on top. Set aside. 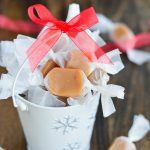 Mix 1/4 cup maple syrup, molasses, vinegar, paprika, and ginger together in a liquid measuring cup and set aside. Line another baking sheet with foil (for easy clean up) and add cornstarch, sugar, salt, and pepper to the middle of the pan, mix it together and spread it out. Pour oil in a large non-stick skillet and heat over medium-high heat. Pat the tenderloins dry with a paper towel and then dredge in the cornstarch mixture. Shake off excess and then place in the heated pan. Repeat with the other loin and place an inch apart from the other loin. Sear on all sides (about 8-10 minutes). Place tenderloins on rack. Pour off any fat in the pan and then add the syrup mix and cook for 3 minutes while stirring and scraping the bottom of the pan. Turn off heat. Reserve 3 tablespoons in a small bowl. Brush the tenderloins with a tablespoon (each) of the glaze left in the pan. Place in the oven for 15 minutes, remove, and baste again. Repeat basting every 4 minutes (about 2-3 times) until the internal temperature of the thickest part is at least 145 degrees. (I like mine at 150-155 F) Remove from oven and let rest 10 minutes. 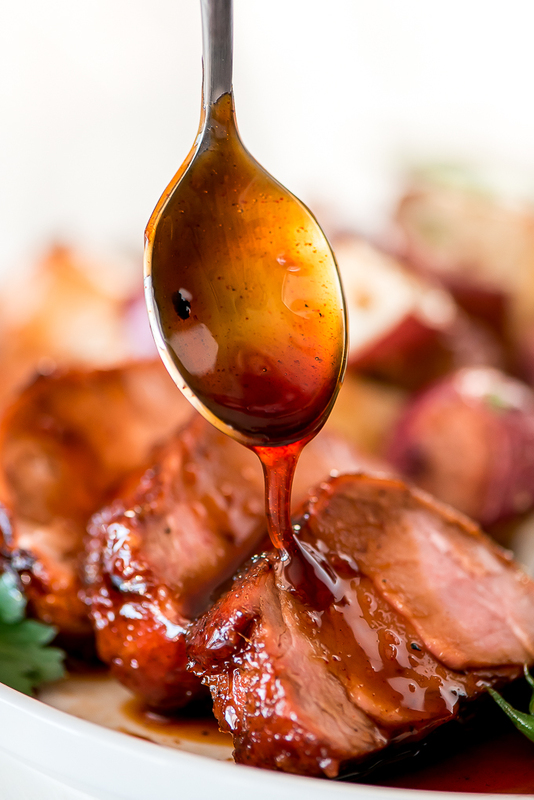 While the pork rests, mix the remaining 3 tablespoons of maple syrup with the syrup mixture you reserved. Brush 1 tablespoon onto loins, slice, and serve with remaining sauce for drizzling over. Yummy! 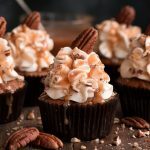 This looks really good, I love pork and this recipe seems it’ll make a huge success with the family! Thank you Isadora! They’ll love it!